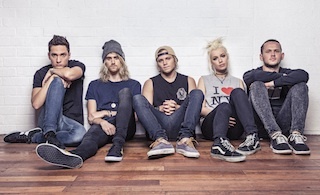 Tonight Alive have revealed in a new interview that fans can expect a new album in 2015. The band are aiming to hit the recording studio this December and are hoping to have half of the follow-up to 2013's The Other Side written by June. Jenna: We’re gonna go back to Australia and then we’re gonna go away and write. We wanna have half the album done by June because we plan to record by December, so the pressure’s on a little bit but the whole year’s ahead of us still so it’s hard to gauge how much time we have left. It seems like a we have a long time but it always creeps up. We recorded ‘The Other Side’ in the summer of 2012 and it came out the summer of 2013. Matt: Any spare time we have, even if it’s on the road, we have to be doing something towards the new album because we’re gonna be out on tour from August until Christmas and then we’re gonna have to go in and record it, so the only time we really have is now. Jenna: You have to plan ahead with this lifestyle. WILL YOU BE AIMING FOR NEXT YEAR TO RELEASE THE NEW ONE? Jenna: Yeah, 2015. Every two years we’ll put out a new album. ‘What Are You So Scared Of?’ came out in 2011, ‘The Other Side’ 2013, this one 2015. We’re on a two year cycle.